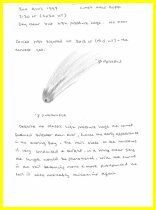 Comets visible to the unaided eye don't come along often, so to have two within the space of twelve months in 1996 - 1997 was something quite special. Hale-Bopp, discovered by Americans Alan Hale and Robert Bopp, was the first we heard about. 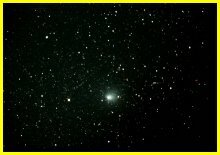 The photograph was taken in July 1996 through a telescope, when the comet was approaching the Sun and was just starting to develop a tail. 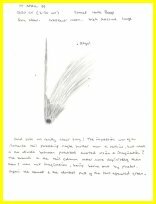 In early February 1997 it emerged again from behind the Sun with a gloriously bright nucleus and a tail that started short, fat and straight and developed during the latter part of March into a long sweeping curve. Into April and the straight gas tail was visible too. The comet's tail is formed of particles ejected from the nucleus by the heating effect of the Sun. Think comet and everyone will think of a long, curved tail, but the shape we see depends very much on the angle we view it from. Hale Bopp had a classic tail, Hyakutake's was quite different. The tail we normally see is the dust tail, composed of particles that are relatively heavy, so as they leave the nucleus they slow and lag behind, giving the curved shape. The gas or ion tail is composed of much smaller, lighter, faster moving particles, and if we see it at all it is straight. Hale Bopp's showed up beautifully on photographs as a stunning blue. The nucleus of Hale Bopp was interesting. I observed it telescopically looking saucer shaped with two 'bow waves' ahead of it. Evidently I was lucky enough to catch it ejecting some material fairly forcefully.